The BeebZIF from RetroClinic is a modern version of the classic ZIF socket that was extremely popular back in the day. 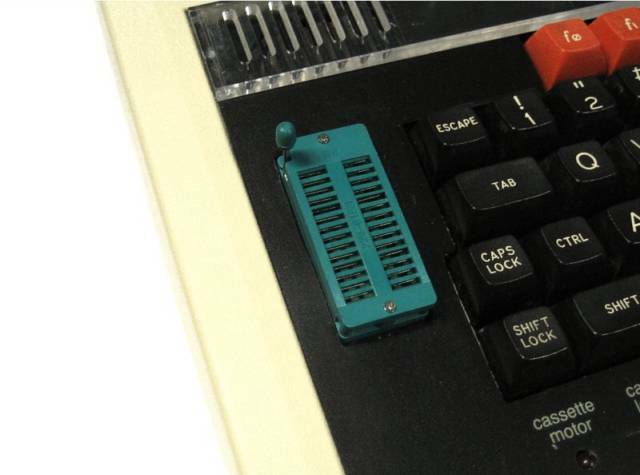 It is a socket which mounts into the "ash tray" area of your beeb, the part that is often pressed out leaving a gaping hole to the left of the keyboard. Once fitted, the kit allows you to swap ROMs in your system very easily, without having to open your case every time or risk damage by using a chip extractor (or more often than not a screwdriver!). Simply power off the computer, change ROM, and power back on - it's that simple. The ZIF (Zero Insertion Force) socket means that you do not need any tools to insert or remove a ROM, simply drop it into place and push the lever down, which secures the chip and makes contact with the pins. What is different about this version to the original? The BBC Micro was designed to take ROMs onboard that are either 8k (2764) or 16k (27128) capacity. Each ROM is put in a separate socket, and performs it's own function. However, larger EPROMs soon became available, and now are easy and cheap to source. A 32k (27256) ROM is twice the capacity of a single Sideways ROM that the original Beeb uses, so it is possible to fit two separate ROM images onto that one chip. Using a 64k device (27512), you can fit 4 images onto the device. The Original ZIF socket was only compatible with chips that the BBC could use, but this new updated version goes a step further, and allows you to use the larger capacity devices. If you have an EPROM programmer, you can program up to 4 ROMs into a 27512, and have them all available at once from the ZIF socket, no switching between - all 4 will be there together and available to the system. Of course, it's still fully backwards compatible with the original ROM sizes the Beeb uses. The BeebZIF can also be configured another way - to make use of Sideways RAM. You can have the ZIF socket wired so that it can take regular 2764 and 27128 ROMs as normal, but then, if you need some sideways RAM, simply put a 62256 (or compatible) chip in the ZIF socket, and you have instant access to 2 banks of Sideways RAM. When you're finished, just remove the RAM chip, and go back to using ROMs as normal. All seamlessly, and without flicking switches or changing configuration. 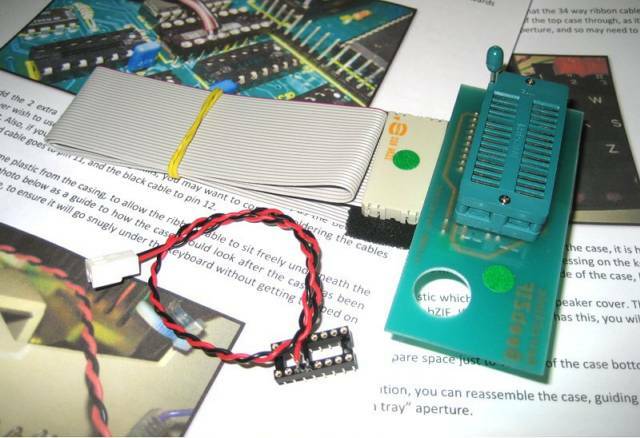 I do not yet own a RetroClinic BBC Model B ZIF socket kit. BBC Model B, B+ and Master 128. The BBC Model B ZIF socket kit no longer appears on the retroClinic website and may no longer be available. Please check with mark@retroclinic.com.